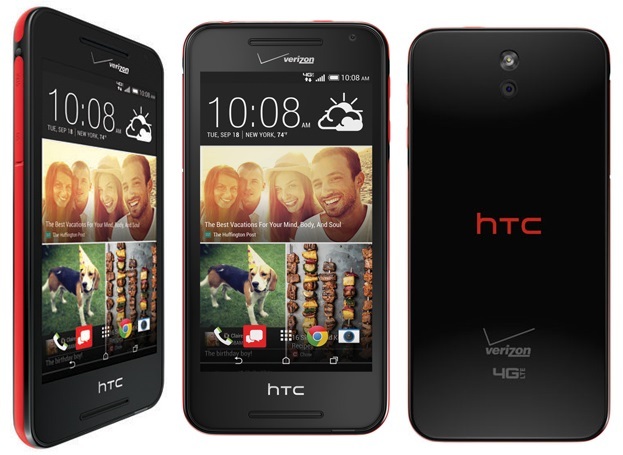 Verizon is preparing to bring 4G LTE aka XLTE with the addition of BoomSound in mid-level HTC Desire 612 on 9th of October. Its almost identical to AT&T HTC Desire 610 except the screen resolution is bumbped to 720p from qHD. The Desire 612 packs a 1.2 GHz quad-core processor, 8GB of built-in storage, microSD card support, an 8 MP rear camera with LED flash, a 1.3 MP front-facing snapper, dual front-facing stereo speakers, and a 2,040 mAh battery. The phone runs Android 4.4 KitKat and has support for Verizon's XLTE network for fast data speeds. The Desire 612 will be free with a new two-year contract from the carrier. You'll also be able to get it using Verizon's Edge installment plan, if you qualify. And for a limited time, customers who activate or upgrade to a new smartphone on The MORE Everything Plans with at least 1 GB of data will get an extra 1 GB of bonus data per month for up to 24 months, as long as that smartphone remains active on The MORE Everything Plan.